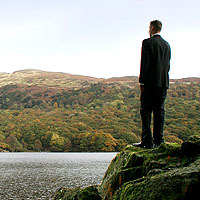 Corporate Walks and Events with Striding Ahead LLP. Your Corporate Team Building and Hospitality Event. Leave traditional ideas at the office..! Not all corporate hospitality events have to be predictable and expensive! Let Striding Ahead LLP organise a team bonding or corporate hospitality event for you. Striding Ahead LLP can provide your organisation with a real ‘value for money’ alternative to the more traditional and expensive team bonding and corporate hospitality events, providing an opportunity for you and your organisation to develop existing and new relationships. The Striding Ahead LLP team are happy to discuss any aspect of your walking event and tailor routes to suit you and your team. Our superb knowledge of the countryside means you can explore places you may not otherwise discover. 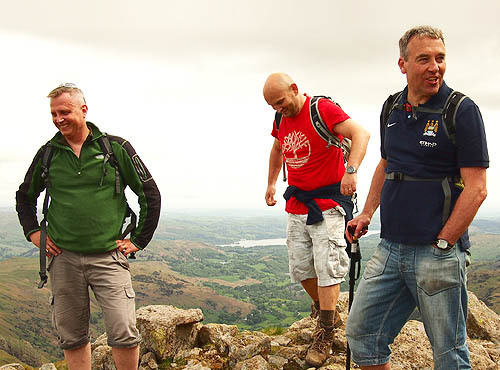 From invigorating hill walks to breathtaking mountain terrain, we offer a choice of adventure levels to suit your event and the overall ability of your group or team. We aim to make your event as much fun as possible and perfectly suited to your requirements, which is why Striding Ahead LLP operates three different levels of walk – Starter, Intermediate and Challenging. We will provide you with all the information and equipment you and your team or group will need, leaving you to enjoy the day to its maximum! A PDF Information Booklet for distribution to your guests will be provided prior to the event which will include directions to the meeting point for the event and advice on equipment and other factors, along with a complete itinerary of your day. This PDF Information Booklet also display your company’s branding. Each guest will receive their own Welcome Pack, including a personalised map of the day's route with the day's weather forecast (which also includes your company's branding), plus a complimentary gift as a keepsake to remember your day with Striding Ahead LLP. Breakfast, tea, coffee, a packed lunch, snacks and water for guests will be provided on the day. Striding Ahead LLP has its own equipment pool of boots, waterproof jackets/trousers and hats/gloves which can be pre-ordered and used, free of charge by any of your guests. Equipment is issued on the day of your event, prior to the start of the walk. 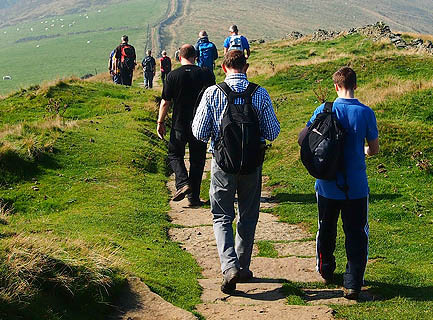 All walk leaders employed by Striding Ahead LLP have a strong familiarity with the areas in which we operate and are qualified with the relevant NGB qualifications, as well as being fully qualified in First Aid. Your walk leader(s) will carry the appropriate safety equipment for the event, such as a group first aid kit, mountain safety shelters and from time to time mobile radios. The actual safety equipment carried will be appropriate to the event. An electronic photo album will be emailed to you after the event as a memoir. Striding Ahead LLP is fully insured with a public liability of £5,000,000 along with employer’s liability insurance for its employed freelance instructors and Activity Specialists / Technical Advisors. We only use suppliers that help us to provide our high levels of service and expertise. Certificates and accreditations of the above are available on request. Taking part in our Corporate Adventure Programmes with friends, clients and colleagues allows people to work together, pooling skills and abilities to overcome obstacles and promoting positive attitudes towards group success rather than self-achievement. All our activities offer your company a great opportunity for networking, team bonding and exercise in some of the most scenic locations in the UK. "Give your team something to really talk about!" Making sure that your team integrates and communicates is a vital aspect of any organisation. A team bonding event with Striding Ahead LLP offers a great opportunity to get to know your team and invest quality time in them. Using Striding Ahead's expertise and knowledge of the most inspirational walking locations in the UK, you can provide your employees with the opportunity to enjoy the fresh air and scenery which the British Countryside has to offer. "An inspirational and a professional approach!" Maintaining existing and gaining new clients is vital in today's corporate environment. Building on personal relationships and building trust is one of the major objectives of our corporate hospitality days. With your customers being your company’s greatest asset, keeping them and looking after them is what drives a successful business. 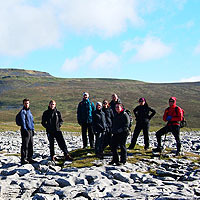 A guided walking adventure in the outdoors is the ideal solution for your team to consolidate existing and new relationships within the workplace. A walking and networking event can help you improve your business’s performance, products and staff skills. By incorporating your existing and new clients, suppliers and contacts in your walking adventure you can use your event to compare and discuss issues of common interest and boost your team’s reputation and gather new leads.